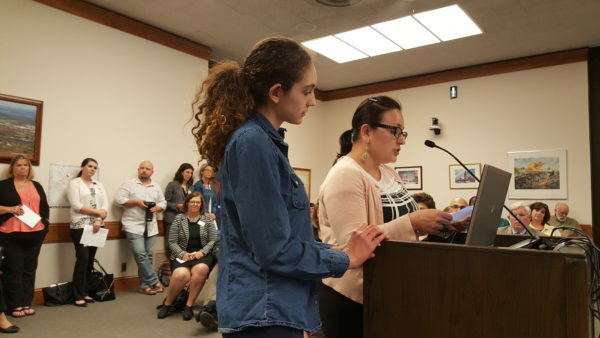 Cintia Miranda (right), a Brazilian immigrant living in Bangor, spoke at a Bangor City Council meeting on May 22 with her daughter Isabel Kidwell, 13, in support of the city helping to fund the new Maine Multicultural Center. The money would allow the center to hire an executive director and an administrative assistant, and fund the creation of detailed business and marketing plans, said Pamela Proulx-Curry, who is also dean of UMA’s Bangor campus, where the center is based. The center was created to host cultural events throughout the city and provide a range of services that help immigrants get acclimated to the area — from helping people connect with immigration lawyers and housing to getting their kids into school or teaching them how to do everyday activities like shopping. The executive committee — which includes representatives from local non-profits, medical centers, and universities, and meets monthly at the University of Maine in Augusta’s Bangor campus — has been focusing mainly on fundraising and applying for grants. The city council did not vote to commit the funds on Monday and it is unclear when it will discuss it next. Councilor David Nealley said he wanted leaders of the center to raise the money through other means first, but several other councilors said they plan to approve the funds. If eventually approved, the $100,000 would be the city’s first financial commitment. The city council had previously pledged its support for the multicultural center. It also added Tanya Emery, the city’s community and economic development director, to the center’s steering committee — the volunteer body that oversees its larger vision. Cintia Miranda, a Brazilian immigrant who spoke at Monday’s meeting with her daughter at her side, said growing up she did not speak any English, was hungry, and lacked basic necessities. Since moving to Bangor in 2009, her daughter has thrived in the schools, she has volunteered her time helping the community, and has started a business that created jobs. A multicultural center could make Bangor a better place for immigrants to live, work and raise a family as well, she said. Officials in Portland are currently pushing a similar immigration support network called the Office of New Americans. Correction: A previous version of this story contained biographical errors about Cintia Miranda. She spoke little English and lacked basic necessities when she was growing up — not when she moved to the area. This story has been updated.